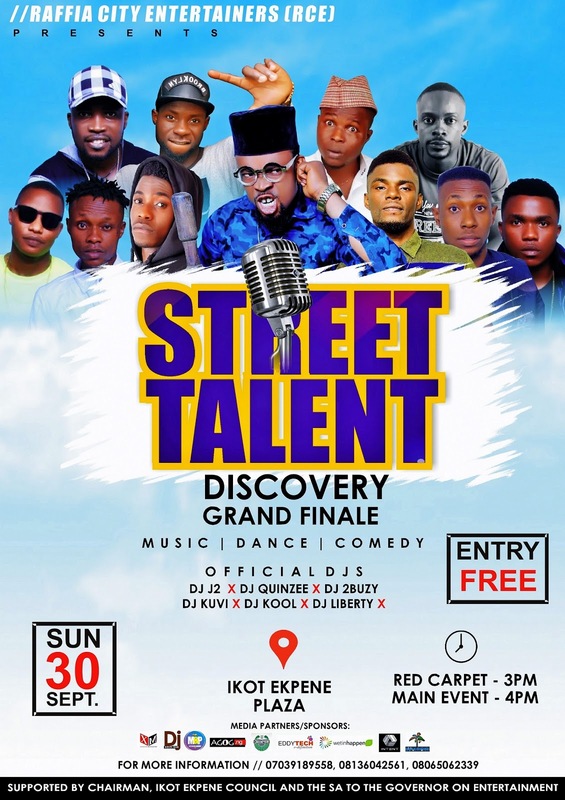 Raffia City Entertainers (RCE) presents “STREET TALENT DISCOVER” Grand Finale. Raffia City Entertainers (RCE) is the umbrella organization of all entertainers in Ikot Ekpene the Raffia City made up of Music Artistes, Music and Movie Producers, Comedians, DJs, Dancers, Bloggers Beauty Queens, Event Planners and Show promoters. “STREET TALENT DISCOVERY” 2018 which is a brain child of one of Raffia City Stand Up comedian, Mc Gentility is aimed at reversing the entertainment challenges faced by entertainers in the area as well as discovering raw talent on the streets. 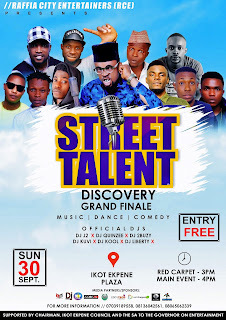 Following the just concluded Street to Street Talent Discovery shows held in various streets in Ikot Ekpene the Raffia City, were performing artistes in Singing, Dancing, Comedy, Disk Jockey, Acting and Spoken words were selected, the Grand Finale is set for the finalists to battle their way to the top as they get discovered. Artistes scheduled to perform at the Grand Finale are: Xbeef, Nazi, Mc Gentility, Rolex Dimm, Wizzy T, Dope Boy, Mc Goodman, Mc Funny Machine, Orlah Jaey, T.I.G and lots more. Official Djs: Dj 2Buzy, Female Dj Quinzee, Dj Kuvi, Dj Liberty, Dj J2, Dj Kool and Dj Rexz. Time: Red Carpet – 3pm, Main Event – 4pm Prompt. “STREET TALENT DISCOVERY” 2018 is officially Sponsored by is Champion Breweries Plc, Uyo, Akwa Ibom State.